It’s easy to feel some ambiguity when it comes to high index lenses. Some of the most common questions floating around about high index lenses have to do with spelling differences, refractive index numbers (1.74, 1.67, etc), and the availability of high index lenses with regard to frame style. Hopefully this article will clear up the confusion if your understanding of high index lenses is a bit hazy. First of all, there are a variety of ways that “high index lens” is spelled. For instance, in the UK, it is more common to see the word lens spelled lense. In America, on the other hand, it is becoming increasingly common for words to be truncated in favor of smaller, more phonetic spellings. 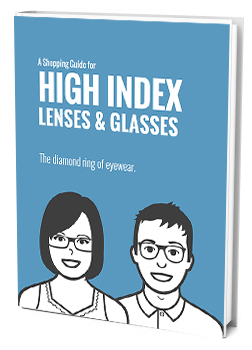 So it’s not uncommon to find “high index” written as “hi index” or “hi-index.” All of these different spellings, from hi index lense to high index lens, are describing the same thing and should not be regarded as different when you’re shopping around online. Another common misconception is that high index lenses are regular plastic lenses that are upcharged and made to seem more special than they really are. This is not the case. Refractive index describes how efficiently a medium can refract a ray of light. In other words, the higher the “refractive index” of a lens, the thinner it can be while bending the same amount of light. For example, the refractive index of water is about 1.33 and the refractive index of diamond is 2.42. This means that you need almost twice as much water to bend the same amount of light as a diamond can. That being said, it’s no wonder that the higher the refractive index, the more high index lenses cost. So, where high index 1.67 lenses may have a $75 up-charge associated with them, you can expect the cost of high index 1.74 lenses to be $100 or more at the same store. However, if a store claims to carry “high index polycarbonate lenses” as something different than standard polycarbonate lenses, it’s a good idea to move on to a different store. The refractive index of polycarbonate is always the same: 1.58. At this point, you may be wondering, just what are high index lenses? Is polycarbonate above or below the cutoff at 1.58? While, by (outdated) conventional standards, any lens with a 1.54 or higher refractive index can be deemed “high index,” in reality, modern technology has come up with indexes so high that it has become necessary to form a “mid index” category between standard plastic and high index. Normal index lenses are generally between 1.48 and 1.54, mid index lenses are between 1.54 and 1.60, high index lenses are between 1.60 and 1.74, and ultra high index lenses are above 1.74. A few other categories of lens types associated with high index eyeglasses that are worth mentioning are aspheric high index lenses, high index sunglasses, and wrap around prescription sunglasses. Aspheric high index lenses are not perfectly spherical in their curvature, reducing lens thickness and the distortion which causes the “bug eye” look. An aspheric lens has better or the same optical quality compared to a simple (spheric) lens. Because of this, it is very, very unlikely to ever encounter a simple lens in high index, so you can expect that all high index lenses are aspheric. High index sunglasses are a common offering where you can get wrap around prescription sunglasses because of the curvature of prescription sunglasses. If you want a wrap-style frame and you have a stronger prescription, high index may be the only way to go. This is because thicker lenses can compromise the optical quality of a curved lens, like in wrap around prescription sunglasses. The thinner material in high index sunglasses can drastically improve the optical quality of the lenses, and it is sometimes the difference between whether a prescription will work in a wrap around frame. Hopefully this article removes some of the ambiguity associated with shopping around for high index glasses on the web. In general, you can expect that high index lenses are going to be thinner and lighter than other lenses offered at a store. Additionally, because of the high refractive index, high index lenses should always be purchased with an anti-reflective coating, as higher indexes cause more reflections and glare. If you still have questions about high index lenses, take a look around at our other posts to learn more. You’ll probably find the answer you’re looking for. Good luck, and happy shopping!